Known for our outstanding service and performance, we strive to not only meet but to exceed the expectations of both our guests and homeowners. Guests can book online or call the office and book with a reservationist, anytime. We provide service 7 days a week, year round including holidays. Additionally, homeowners can check on upcoming reservations, income, and expenses posted on statements as well as easily block off dates for their own use right online anytime, day or night. With a professionally trained staff in all departments; including management, reservationists, housekeeping, maintenance, spa services, etc., we provide exceptional service to both our guests and homeowners. Click Here to see what our Homeowners are saying! We check in with the guest within several hours of arrival to ensure we can address any issues in a timely, friendly, and hospital manner. We have a top top-notch housekeeping staff. They are honest, trustworthy, supervised, receive regular training, and have a consistent cleaning process for each stay. We inspect the property after each guest, checking for any damage and inspecting for maintenance issues as needed before the next guests arrive. We make every effort to do a drive-by of your property while the guest is there to help assure that the noise, occupancy and parking rules are being followed. Rates - Big Bear Cool Cabins can set and adjust rates for you which is what most homeowners prefer. We can raise and lower the rates based on many factors including the number of existing bookings, snow amounts, holidays, length of stay, and many other market dynamics. 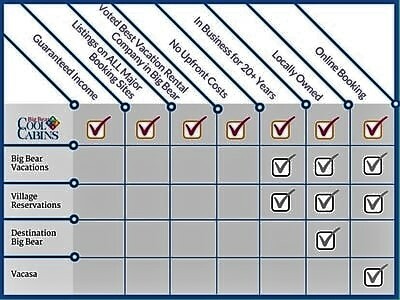 For those who prefer to set your own rates, we will happily use the rates as you want them. Maintaining good relationships with your neighbors is a high priority for us. We make sure that they have our phone number and keep the communication lines open. Reach out to get a free consultation!